Initially supplying the local garage trade, Brakes International quickly expanded and opened a branch in Bolton. Today, braking components are imported and distributed throughout the United Kingdom from a 15,000 sq. 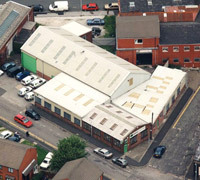 ft. warehouse in the heart of Rochdale. There are over 30 dedicated staff, with comprehensive training facilities, a data/technical department and an in-house graphic/web design studio. Sourcing products directly from original equipment manufacturers and top quality aftermarket producers has allowed Brakes International to provide our customers with high-quality components at unbeatable prices. Brakes International offer the largest range of brake parts in the UK for cars and light commercial vehicles. As a key supplier to the automotive trade offer unrivalled technical expertise. As part of our commitment to use technology to enhance service, a unique on-line catalogue/ordering system has been launched. Customers find it amazingly effective.